Interactive Fiction (part 1) at Play With Lua! Like it or hate it, and there are plenty of reasons to do both, object-oriented programming is an idea that you can’t escape. Practically every language and every library uses it. Every CS curriculum teaches it. Every learn-to-program tutorial explains it. And so, people have some funny ideas about what it exactly is. If your first language supports it (like Java or Ruby, say) then it becomes very hard to distinguish between object-oriented programming and how your language does object-oriented programming. Unless you’re using Lua. Because OO in Lua is whatever you write for it. The language doesn’t offer any of what a Java programmer would consider essential features, like classes, instance variables, even types. What it offers is a way to make those things. So that’s what I’m going to do over the next couple posts, in the process of writing a miniature interactive fiction engine. At the end it’ll look a little bit like this except that I’m going to make a bunch of compromises that Zarf never would, because he’s smarter than I am and can foresee how it’ll mess everything up. Also because he intends to use his for longer than a blog post. First, let’s define what we’re going to do. We want to have a system that simulates a world, which interacts with the user solely through text. We’ll give it commands like “get lamp” or “walk north” or “put chalice on altar”, and it will change the game state in some way and respond with a message. First, let’s talk about how we’re going to represent the game world. As far as nouns go, there are two kinds of things in our game: there are rooms, which are the locations the player can be in (“you are in the kitchen”), and there are props, which are the things that are in the rooms (“there is a knife and a pan of brownies here”). Props can also be other places too, like in the player’s inventory or inside other props (“the chest contains a sword and a blue cloak”). 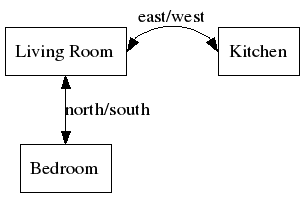 So the world is a directed graph of rooms, and each room is the root of a tree of objects. In addition to this, there can be other “global” factors at play, like if it’s dark then all room descriptions are “it’s dark, you may be eaten by a Grue”. We’ll have a list of global rules that aren’t part of the world graph, but get first dibs on any command. This first post, we’re going to lay the groundwork, and talk about how to implement rooms. First though, since this is ostensibly about object-oriented programming, it’s about time we mentioned objects. Now we need the operations to manage the data. 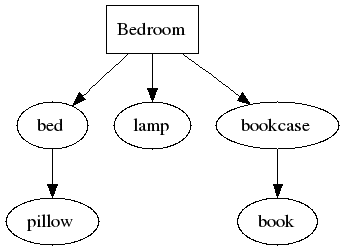 We could just make these be functions stored in the table, but we have to assume that we’ll have lots of different rooms sharing the same functions (after all, what does print_description do differently for the bedroom than the kitchen), so we should have a way to share these across different objects. Lua provides a facility called metatables, which control how tables respond to different events, like someone looking for a key that isn’t there. In that case Lua looks in the metatable under __index, and if that’s a function it calls it (with the table and the missing key). As a shortcut, if __index is a table it just looks in that table for the missing key. So that accounts for the state and the functions to handle the state. Notice that nowhere in there is there anything that corresponds to a class, or a type. This is just an object. The only primitives used at all are tables. Since we made this system ourselves in the language, instead of it being provided for us by the language, we can mold it some to fit our problem better. name = "Kitchen" -- And all the rest . . . Okay, so, now we’re talking. We can now represent a single room, so a table of these is a list of the rooms. Let’s make that table (which I won’t do inline because it’ll be long and repetitive), and then start thinking about how to interact with them. return "Sorry, I didn't understand that"
A well-appointed but cluttered living room"
"There is no exit that way"
"Sorry, I didn't understand that"
Now we’re just one parser and some props away from a system that can make interactive fiction. About two pages of code so far, counting the descriptions of the rooms. Next time, we’ll finish it!